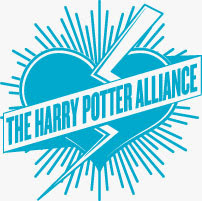 The Harry Potter Alliance is now hosting their 10th Anniversary Fundraiser, which ends in a mere 8 days! The alliance has done some amazing feats thus far, as they channel fans love for the boy wizard into real life, almost “magical” feats to improve our world. This includes donating 250,000 books for communities across the globe, sent cargo planes with supplies to Haiti, and more. The fundraiser is up now IndieGoGo, and you can help in keeping the Hogwart’s dream alive! The Harry Potter Alliance (HPA) fights worldsuck in many of its most insidious forms, and we’ve been doing it for ten years now! Since 2005, we have organized campaigns in support of LGBTQIA+ rights, literacy, media reform, workers rights, disaster relief, genocide prevention, and much more. We’ve also created a worldwide network of fans who channel their love of story into real-world activism, advocacy, and charity. What can we achieve in the next ten years? The sky’s the limit! Help us to continue building this movement with a generous donation today. They are almost 80% funded, so close to their goal! Head over to their IndieGoGo page at https://www.indiegogo.com/projects/harry-potter-alliance-10th-anniversary-fundraiser#/ and help the world and love the Harry Potter universe at the same time.